Creative Paperclay® is a unique air hardening modeling material that requires no firing in a kiln or baking in an oven. It is clean, odorless and easy to use. It feels similar to an earthen clay; however, it contains no clay in it at all! It can be sculpted, molded or shaped while it's moist and it accepts and retains fine details. It adheres easily to wood, canvas, and most surfaces without glue! Best of all Creative Paperclay® air dries hard. No hassling with a kiln. When dried, it's similar to a soft wood. It is very lightweight and durable. It may even be carved or sanded after it has hardened. Check our Project pages for fun and easy ideas on working with Paperclay modeling material! Pearl Paperclay® is an economy grade modeling material especially developed for schools. 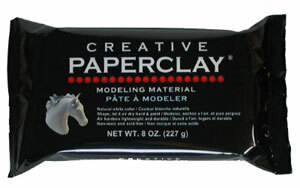 Pearl Paperclay is value priced and a great alternative to instant paper mache or Styrofoam based products. It is made from all natural ingredients, is non-toxic and biodegradable (it carries the Art & Craft Materials Institute AP non-toxic label!). Comes out of the package ready to use (no mixing or kneading required) in a clean white color. Its very soft and fine texture can be sculpted, shaped or molded very easily while moist. After it air dries, it becomes very hard, not spongy. It can be painted or colored with tempera, acrylics or markers making it ideal for kids crafts or classroom projects! DelightTM is an exciting new modeling medium. It is pure white in color and extremely soft and easy to shape or mold. This non-toxic material is super clean to work with and picks up details beautifully. DelightTM holds its form while shaping and then air hardens to create an extraordinarily lightweight (about ½ the weight of our Creative Paperclay® by volume) and durable finished piece. Water base paint can be kneaded into DelightTM very easily and without mess to make an infinite range of colors with which to work. Of course, it can be colored with any kind of paint after it's dried. available in all Michaels Stores! Click logo for a store near you.